With a few exceptions (hearing aids, collectibles) as technology evolves, prices for these services drop. Unless you're the cable and broadband industries, cozily ensconced in a bubble of regulatory capture. The US Bureau of Labor Statistics tracks prices for broad categories of goods and services over time, and as Business Insider notes, a quick look at the eighteen year trend of technology goods and service pricing shows cable relatively alone when it comes to product pricing rising steadily over time: The problem is that chart doesn't really work, since comparing cable TV to the cost of, say, audio gear isn't really an apples to apples comparison. 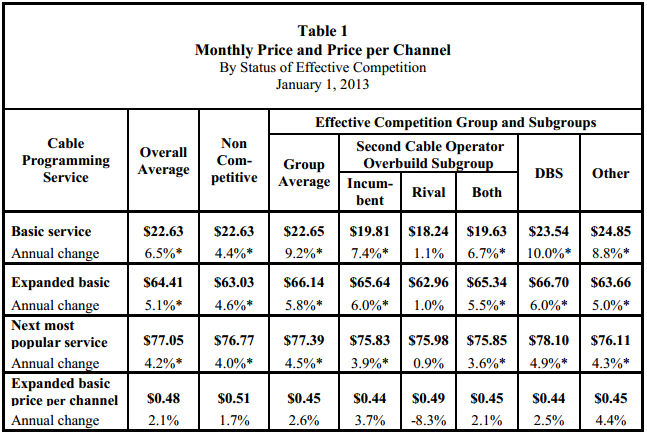 Unfortunately for cable, things don't look much better even if you're comparing cable TV prices to other, marginally-similar services (streaming TV, satellite radio) or, say, inflation. Last year, the FCC released a study (pdf) that showed that cable rates have risen at around four times the rate of inflation. Over an 18-year period from 1995 to 2013, cable rates increased 6.1%, while the Consumer Price Index’s compound average annual rate of growth during the same period was just 2.4%. 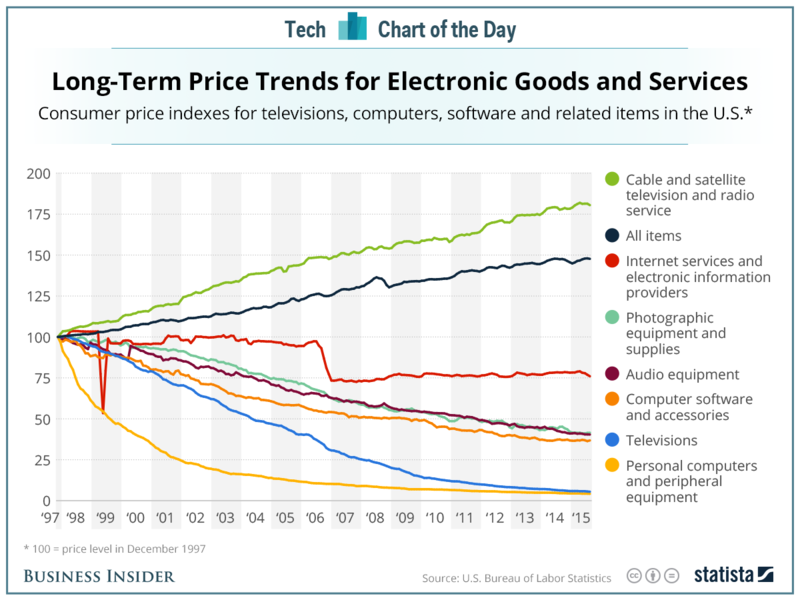 So yes, cable prices are rising faster than pretty much any other technology. And note most comparison data doesn't even include all of the sneaky fees and set top or modem rental fees cable industry likes to bury below the line to artificially keep advertised rates lower, so things are actually worse than 90% of analysis you'll read. Data from SNL Kagan suggests that cable companies' average revenue per user grew from $119.24 in 2010 to $161.12 this year - an increase of more than 35 percent. Should you ask a cable exec why this is, they'll tell you it's because of the exceptional value cable TV offers, ignoring that cable has some of the worst customer service in any U.S. industry. "Over the 12 months ending January 1, 2013, the average price of expanded basic service increased by 4.6 percent, to $63.03, for those operators serving communities for which no effective competition finding was made as of January 1, 2013. For the effective competition communities, the average price of expanded basic increased by 5.8 percent, to $66.14." And again, that's because these companies aren't competing -- they're blowing sweet kisses at one another and paying politicians to look the other way. Some folks might recall that this was all supposed to change when the phone companies entered the TV industry back around 2006 or so. AT&T (U-Verse TV) and Verizon (FiOS TV) promised dozens of states that, in exchange for passing new statewide franchise laws written by the phone companies, we'd see an amazing flurry of new TV competition. Of course what actually happened is these franchise "reform" laws were little more than phone company wishlists that gutted regulatory authority and all remaining consumer protections. The end result was higher rates than ever. And yes, the absurdly high price of programming (especially sports programming) plays a huge role in soaring, often bi-annual rate hikes. But it can't be understated that everybody in the delivery chain (from broadcaster to cable operator to local regulators) happily abuses the dying cash cow that is cable TV, whether it's programming rates, set top box rental costs, local franchise charges, or bizarre new fees. There are no innocent parties when it comes to your bloated cable TV bill, and all of the parties currently feeding at the trough behave like it's a party that's simply never going to end. Of course there's another good reason that cable rates continue to skyrocket: people keep paying for it. In fact statistically, about 80% of the people reading this sentence throw $100 or more at their cable company every month for a massive bundle of horribly uninteresting channels they never watch. For many people, especially once they're getting three or four (wireless, TV, fixed-line broadband, voice) billed services from one provider, it basically comes down to being too lazy to deal with paperwork and phone calls. Other times users just realize the hassle of switching won't be worth it since the company they'd switch to would be just as bad as the company they're leaving. On the bright side, there's a twenty-three-mile-wide asteroid headed right for Jurassic-era legacy cable executives. Unfortunately, while the traditional cable TV cash cow will be killed amidst a cacophony of legacy wailing during the upcoming cord cutting revolution, the regulatory dysfunction, campaign finance corruption and duopoly power that built the cable TV monstrosity will remain. And these companies are simply going to switch their attention from price gouging you for an ocean of horrible channel bundles, to price gouging you for what's increasingly a necessary utility: broadband (a market that sees even less competition than television). And they're going to do it in one singular, spectacularly obnoxious way: broadband usage caps. Only by accident. One of the main indicators of a corrupt government I'd say is that is puts it's own need ahead of the needs of the public, and if you assume that the purpose of the government is first and foremost to serve the public a corrupt government is going to be an incompetent government, as they are failing at their primary duty.